November 8, 2001 Halloween has come and gone, but by looking at some of the crew, you’d never know it! The week began with Leonard giving Norm a mohawk, and ended with Norm’s self-shaved bald head – just in time for winter. But in the style department, nobody can compete with Ms. Cherokee, looking sleek and ship-shape. 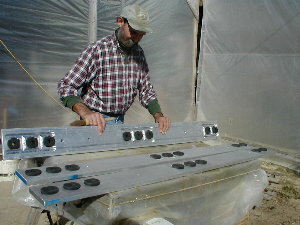 Tom Parker has made much headway with the sewer system, installing the two vents for the blackwater tank. 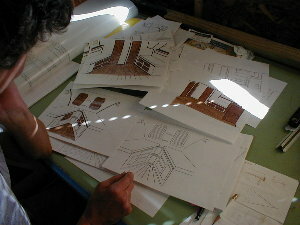 Depicted above, Jim finds himself living beneath the stairs these days as he panels the underside of the stairwell. He’s also been building all the bunks. 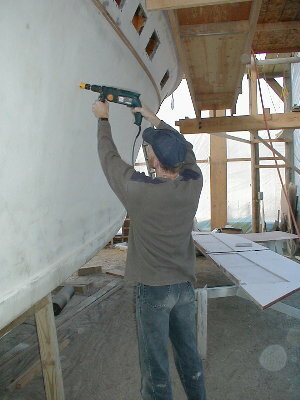 Below, Stuart is shown securing bolts for the port water jet. 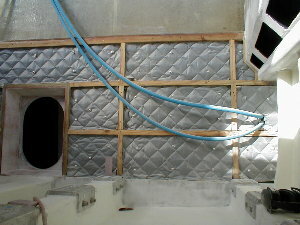 On the right, the blue fuel lines are shown coming through the bulkhead of the engine room. 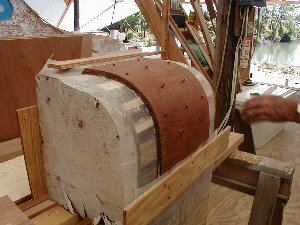 The other ends are connected to the fuel tanks. 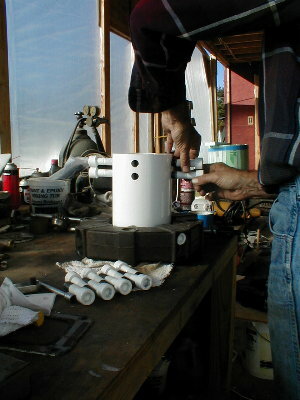 Bill Brown has sanded the main motor mounts in preparation for paint. 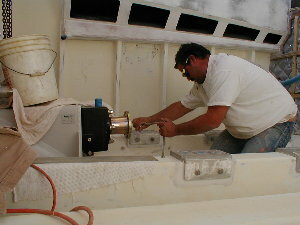 He is priming bare spots on the second engine, and is assembling the Centiflex shafts. 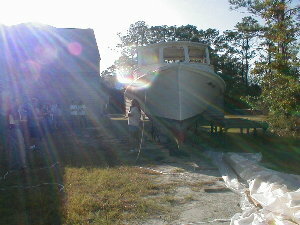 The other engine is finished and ready for installation. Fish Doc’s parents, Nat and Don, were visiting last week, and were quite impressed with the Huckins project. 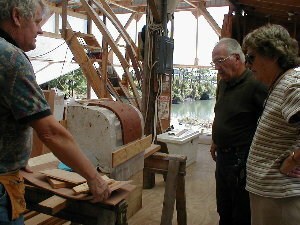 Here Norm points out the various woods used in the restoration – mahogany, teak, Spanish cedar, juniper, and a little heart pine. 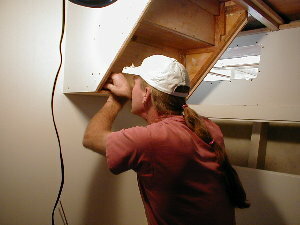 Norm also showed them the process of bending wood over a form, such as the bunk corner below. The master bunk has a corner made out of a piece of the mahogany quarter-round salvaged from the original roof of the pilot house.